In the fall of 2006, I observed this Soldier Beetle (Chauliognathus sp.) prowling around through some weeds and wildflowers in the lower Santa Catalina Mountains near Tucson, Arizona. The Soldier Beetle crawled onto a yellow daisy where a little brown beetle was obliviously eating the golden flower petals. The adults of some species of Soldier Beetle (Family Cantharidae) are fierce insect predators, as are all of their larvae, but this particular Soldier Beetle was only hunting for flower nectar and pollen, which was quite fortunate for the little brown beetle. 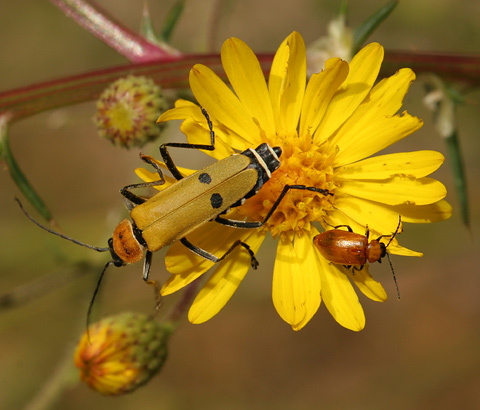 Adult Soldier Beetles in the genus Chauliognathus feed on the nectar and pollen of flowers in the Aster family (Asteraceae), especially daisies and goldenrod. 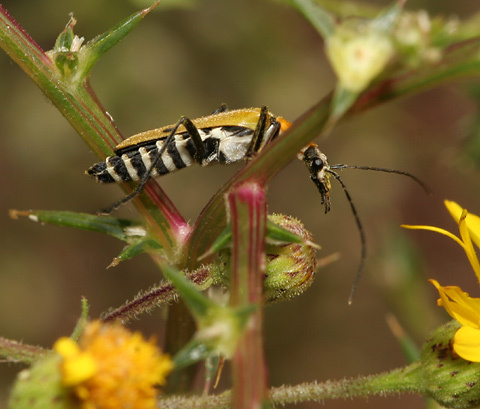 Because their larvae consume insect eggs and other insects, and the adults either prey on other insects or consume nectar and pollen and pollinate flowers in the process, Soldier Beetles are considered to be beneficial insects. 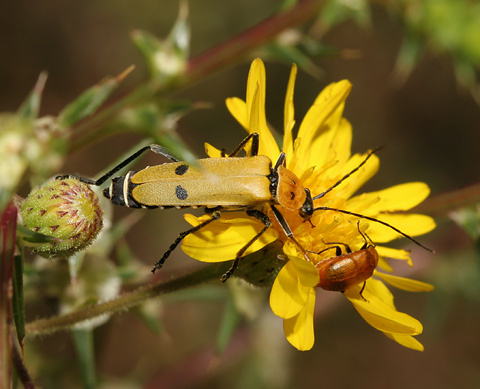 After it had its fill of nectar and/or pollen, the Soldier Beetle crawled off and left the little brown beetle to its voracious petal munching.